Wednesday Wants: Made in the Bay — Oh Wonderful! The one thing that I didn’t expect when I moved up to the Bay Area was the creativity that exists here. Tech was expected, but artists, ceramicists, and fashion designers? I would have never guessed. The Olympic-sized swimming pool of creative talent that exists up here is enough to fill nearly every corner of your house. Everything from your kitchen cabinets, to your walls, and to your closets could be exclusively from makers and designers in the Bay Area. 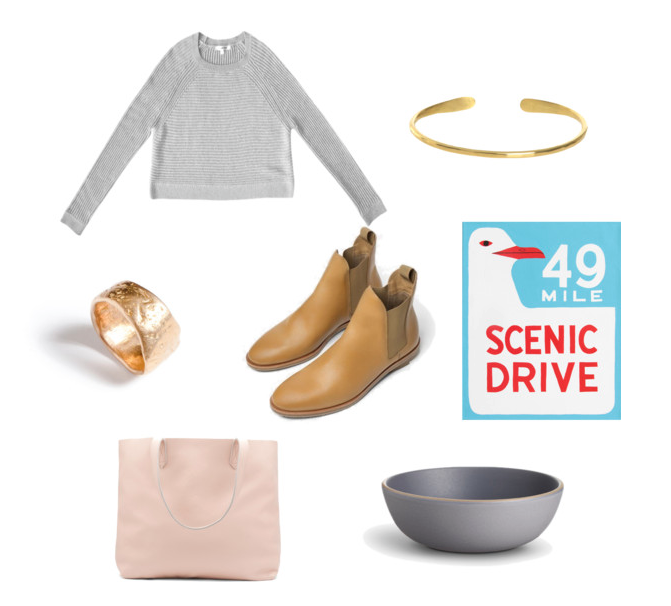 Sweater by Ali Golden – Golden has the airiest shop in Temescal Alley stocked with her handmade and modern basics. Bracelet by Marisa Mason – Another Temescal Alley hotspot, this time a jeweler inspired by the ruggedness of California, with bits of Navajo-influence. Ring by Takara Design – Another Bay Area jeweler who at times, features hand-hammered metals and silky threads of pastel fabric. Boots by Everlane – The online-only fashion company has grown from making duffel bags to releasing capsule collection and these hyper-cool boots. 49 Mile Scenic Drive Print – An infamous sign up here in the Bay, but I’ve yet to drive it. The couple that owns 3 Fish Studios met in Berkeley and now make prints in the city. Bag by Cuyana – Another e-commerce and SF-based fashion startup – this time, Cuyana received seed funding back in 2013. Like Everlane, they’re into transparency into where their products are made and a simple closet. Cereal Bowl by Heath – My cabinets are stocked with mismatched Heath mugs, plates, and bowls and I wouldn’t have it any other way.